Lt. Gen. Nadja West was formally promoted to three-star general in the United States Army on Tuesday, Feb. 9. Photos courtesy of Office of the Surgeon General/U.S. Army Medical Command. Lt. Gen. Nadja Y. West is a trailblazer in the U.S. Army health care system. Acting Army Secretary Eric Fanning administered the oath of office to West on Dec. 11. With the appointment, West, 54, became the first Black woman in the Army to receive a third star. A ceremony took place on Tuesdayto formalize her promotion. West is now the highest-ranking woman to graduate from the U.S. Military Academy at West Point, N.Y. 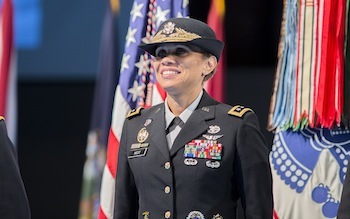 The trailblazer also made history in 2013 as the first Black female two-star general in the Army Medical Department. In her role as surgeon general, West provides advice and assistance to the Army secretary and chief of staff on all health care matters. Sheis responsible for development and overall management of an integrated Army-wide health system. Her responsibilitiesinclude formulating policy regulations on health service support and the establishment of health standards. She oversees more than 48 medical treatment facilities providing care to almost 4 million active-duty members of all services, retirees and their family members. MEDCOM is composed of three regional health commands, the Medical Research and Materiel Commandand Army Medical Department Center and School. Prior to her current appointment, West served as the Joint Staff Surgeon at the Pentagon. She also had previous assignments as commanding general of Europe Regional Medical Command; commander of Womack Army Medical Center, Fort Bragg, North Carolina; and division surgeon, 1st Armored Division, Army Europe and Seventh Army, Germany. 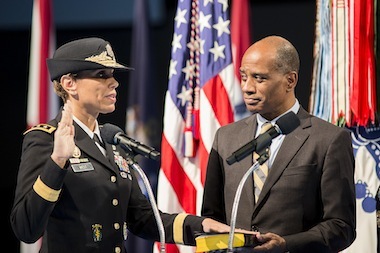 Lt. Gen. Nadja West repeats the Oath of Office while her husband, Donald, holds the Bible during her promotion ceremony. The Washington, D.C., native completed high school at the Academy of the Holy Names in Silver Spring, Maryland. She earned a Bachelor of Science in engineering from the U.S. Military Academy at West Point and a Doctorate of Medicine from George Washington University School of Medicine. At the Congressional Black Caucus Foundation’s Annual Legislative Conference in 2013, Essence magazine and Southern Company honored West with the Armed Forces Medical Advocate Award. In her acceptance speech, sheshared that she was adopted. West was adopted as an infant. Her father was a career soldier, joining the Army when it was still segregated. She and her siblings followed in his military footsteps. Her mother was active in the civil rights movement. She is married to Donald West, a retired army colonel. They have two children, Sydney and Logan. Last year, when Logan was a senior at Gonzaga College High School in D.C., West was the guest speaker atthe school’s Black History Month assembly. She also gave students leadership advice.